Approximately 61 percent of the world's 356 turtle species are threatened or already extinct, and the decline could have ecological consequences. These findings are according to a paper in the journal BioScience synthesizing the global status of turtles and their ecological roles by scientists from the U.S. Geological Survey, Tennessee Aquarium Conservation Institute, University of California, Davis, and the University of Georgia. "Our goal is to provide resource managers with a full picture of the state of these iconic animals worldwide, and what long-term impacts our environment might experience if populations continue to decrease and species loss continues," said USGS scientist and lead author of the study Jeffrey Lovich. "Turtles contribute to the health of many environments, including desert, wetland, freshwater and marine ecosystems, and their decline may lead to negative effects on other species, including humans, that may not be immediately apparent." "Our purpose is to inform the public of the many critical ecological roles turtles perform on a global scale and bring awareness to the plight of these emblematic animals whose ancestors walked with the dinosaurs," said professor emeritus and senior ecologist Whit Gibbons, at the University of Georgia's Savannah River Ecology Laboratory and Odum School of Ecology. "These modern descendants of an ancient lineage are touchstones for how human influences are causing the decline of so much of the world's wildlife. Our hope is that everyone will be encouraged to engage in concerted efforts to conserve their well-earned legacy as part of our natural habitats." 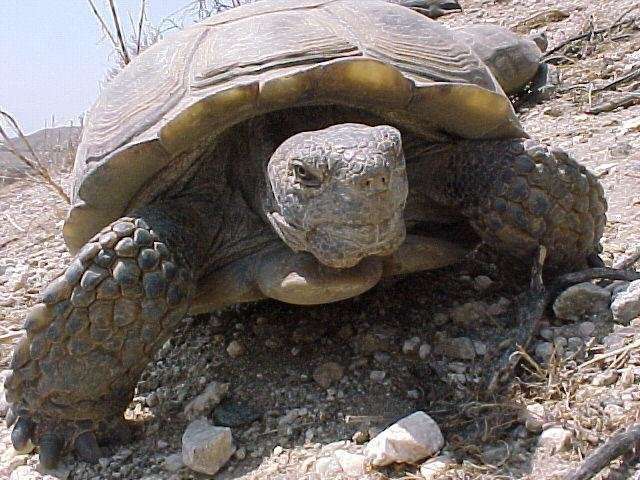 Some turtles, like Agassiz's desert tortoise in the American Southwest and the gopher tortoise in the American Southeast, dig deep burrows creating habitat for other species. For example, the gopher tortoise can dig burrows over 30 feet long. The mounds of soil near the entrance of the burrows can create new habitat for some plant species, increasing overall plant diversity near burrow entrances. The burrows are used by hundreds of other species including spiders, insects, snakes, amphibians, other reptiles, rabbits, foxes and even bobcats. "The ecological importance of turtles, especially freshwater turtles, is underappreciated, and they are generally understudied by ecologists," says Josh Ennen, research scientist at the Tennessee Aquarium Conservation Institute. "The alarming rate of turtle disappearance could profoundly affect how ecosystems function as well as the structure of biological communities around the globe." "We must take the time to understand turtles, their natural history, and their importance to the environment, or risk losing them to a new reality where they don't exist," said UC Davis scientist Mickey Agha. "Referred to as a shifting baseline, people born into a world without large numbers of long-lived reptiles, such as turtles, may accept that as the new norm."